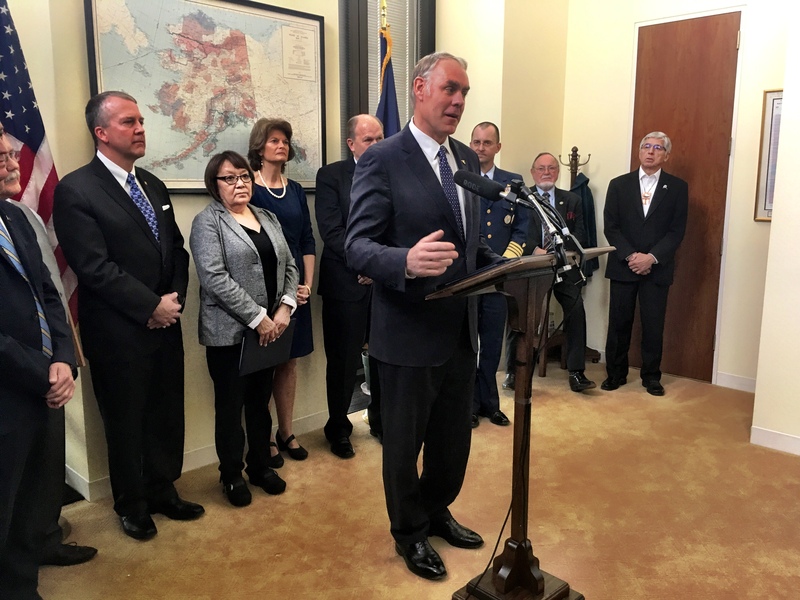 Alaska’s congressional delegation ticked another item off its decades-old to-do list Monday: Interior Sec. Ryan Zinke signed a land swap agreement to allow a road in the Izembek National Wildlife Refuge for King Cove. It’s a major turning point in the dispute over a roughly 12-mile road that would be mostly, or entirely, built on what’s now a federally protected wilderness. King Cove Corporation’s Della Trumble has been fighting for the road for more than 35 years. Now, she’s clutching a blue portfolio holding the land trade agreement. “I’ve always maintained I’m not going to believe it until the papers are signed. So they’re signed,” Trumble said with a small laugh. Conservation groups are dismayed. Some are threatening legal challenges. Audubon says the Izembek is one of the most important bird habitats in the world, critical to migrating waterfowl. Audubon Alaska policy director Susan Culliney said, among things, they’re concerned about transparency in the Trump administration’s management of Alaska’s federal land and water. She said the Obama administration had an extensive public process when it considered the road. “But this time it’s very limited in its public input,” Cullney said. Proponents say the road will save lives, by allowing people from King Cove access to the all-weather airport in Cold Bay. At a press conference after the signing, Sen. Lisa Murkowski displayed two unfancy souvenirs of her fight for the road. One was a legal pad, with a note Murkowski had written to herself four years ago, after then-Interior Secretary Sally Jewell killed a previous King Cove road deal. Murkowski said her staff conveyed a message to her that she found galling. Murkowski saw it as Washington’s callousness toward the safety of King Cove residents. She kept the note on the top sheet of her pad for four years. “I’m officially ripping it out,” Murkowski said, crushing the paper into a ball. An array of officials behind her – local, state and federal – cheered. 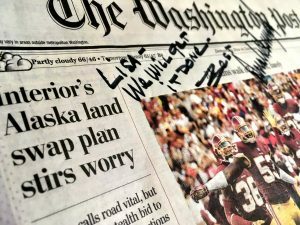 Murkowski also brought the Oct. 16 front page of the Washington Post, featuring a story about the road and a note scrawled in black marker. Trump wasn’t at the press conference, but King Cove Mayor Henry Mack was. He said everyone in his town has had a loved one suffer a frightening medevac, or taken flights from King Cove in fierce winds. Mack said once the road is built, King Cove residents who travel won’t have to wait out bad weather to get home, paying for expensive hotel rooms in Anchorage and wondering how long it will take. “This way here, we can land in Cold Bay, one of our kids can come pick us up in a car. We can go home,” Mack said. The land swap calls for an even exchange between the refuge and the village corporation. Nearly even: Sec. Zinke said the government will gain one acre. In years past, King Cove and the state offered the Interior Department 50,000 acres or more, in exchange for the road corridor. The federal government would have received some 300 acres for every one acre of refuge land. Zinke said he wasn’t interested in driving that sort of bargain. “It was unfair, very frankly,” Zinke said. Gov. Bill Walker said those lopsided offers were a sign of how desperate Alaskans were for the road. Della Trumble said the next step is to conduct land appraisals. Walker said the state might build the road using its federal transportation dollars. With legal challenges likely, Walker said it’s not clear when road construction can begin.